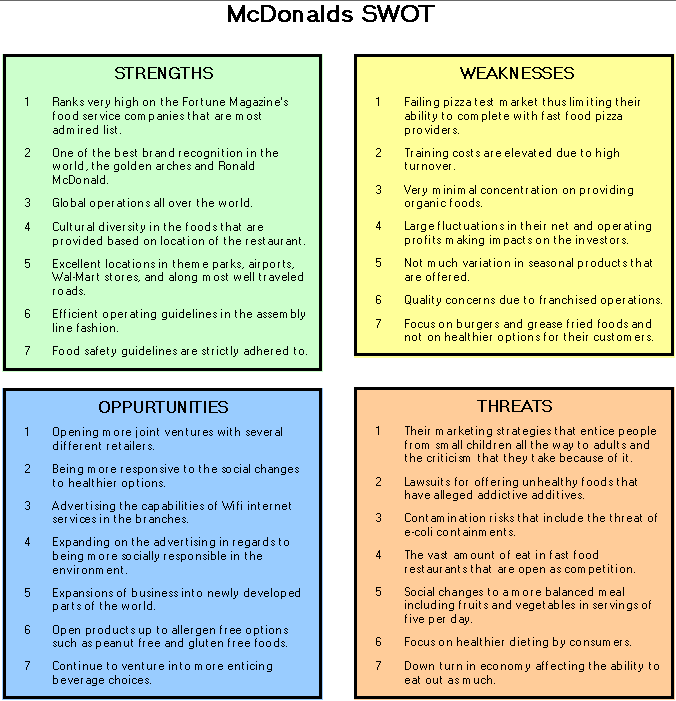 Review this McDonalds SWOT Analysis. At the bottom of this page is a McDonalds SWOT analysis and color report / graph. We used SWOT Manager software to create the report. Ranks very high on the Fortune Magazine's food service companies that are most admired list. One of the best brand recognition in the world, the golden arches and Ronald McDonald. Global operations all over the world. Cultural diversity in the foods that are provided based on location of the restaurant. A large part of the restaurants are franchised out. Excellent locations in theme parks, airports, Wal-Mart stores, and along most well traveled roads. Efficient operating guidelines in the assembly line fashion. Use of top quality beef and chicken products. Use of brand name processed items like Kraft cheese, Dannon Yogurt, and Dasani Water. Food safety guidelines are strictly adhered to. Provide nutritional information to the consumers. Failing pizza test market thus limiting their ability to complete with fast food pizza providers. Training costs are elevated due to high turnover. Very minimal concentration on providing organic foods. Large fluctuations in their net and operating profits making impacts on the investors. Not much variation in seasonal products that are offered. Quality concerns due to franchised operations. Focus on burgers and grease fried foods and not on healthier options for their customers. Opening more joint ventures with several different retailers. Being more responsive to the social changes to healthier options. Advertising the capabilities of Wifi internet services in the branches. Creating more play places for the children in more of the restaurants. Expanding on the advertising in regards to being more socially responsible in the environment. Expansions of business into newly developed parts of the world. Creating a more upscale appearance to attract a more upscale clientele. Open products up to allergen free options such as peanut free and gluten free foods. Continue to venture into more enticing beverage choices. Their marketing strategies that entice people from small children all the way to adults and the criticism that they take because of it. Lawsuits for offering unhealthy foods that have alleged addictive additives. Contamination risks that include the threat of e-coli containments. The vast amount of eat in fast food restaurants that are open as competition. Social changes to a more balanced meal including fruits and vegetables in servings of five per day. Focus on healthier dieting by consumers. Down turn in economy affecting the ability to eat out as much.